You can schedule an Entry for any recurrent payments, such as rents, utilities, mortgage, condo fees, etc. that you want automate. To do so, click on the Schedule at the top of the accounting screen and fill the information in the pop-up window. You will need a Starting Date for when the Entry will start, a Frequency at which the entry will be recurring, and an Advance Notice so you can be informed when the payment is about to come. You can also use the tab Scheduled Entries from the main window under the Accounting menu to create Scheduled Entries. Click on the tab Scheduled Entries, then on New and fill the information as describe previously. *Note that each time you create a Lease, a Scheduled Entry is automatically created and is recurring at the Frequency you specified in the Preferences. As well each time you create a Workorder, a Suggested Entry is automatically created for you too. If you created a One-Time Accounting Entry as described in the previous sub-chapter, the Entry will instantaneously be visible on the Main Accounting Board. However, if you created a Scheduled Entry, it will be listed among others in the Suggested Entries tabbed panel at the specified time (with the specified Advance Notice). You have to either Accept, Edit and Accept, or Deny the Suggested Entry onto the Main Accounting Board. In the Accounting menu, click on the tab Suggested Entries, select an entry and click Accept on the right side menu to push the Entry to the Main Accounting Board. Once accepted the data immediately jumps to the upper portion of the screen. If an adjustment needs to be made, you can first View the Suggested Entry and then edit it before accepting it. If a payment is due but late, you can accept the Entry as Late by one click on Late button on the right side. The Entry will then jump to the upper portion of the screen but the background status color will be red to indicate that the entry is late (Date Paid is empty) and the Amount Paid will be 0.00. If you want to add a Late Fee to a normal Accounting Entry, select the Entry, click View on the right side menu, then click Late fee button on the top menu. Note that the amount is already there from the information you entered in the tenant's Lease. 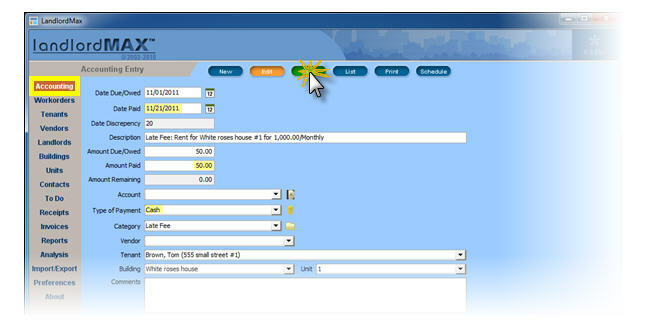 The software only offers a fixed amount for automatic Late Fee calculation. Anything beyond this must be manually calculated and entered into the software. 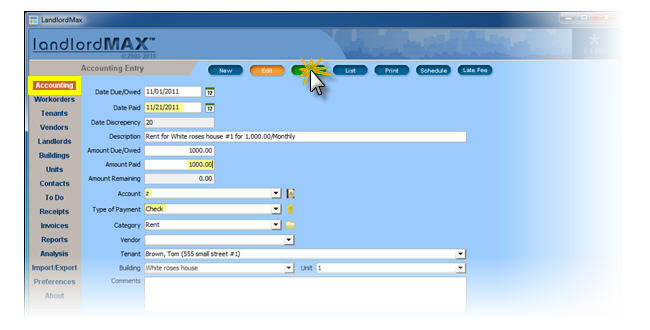 Enter the amount paid as $0.00 (if the tenant hasn't already paid the Late Fee) and click Save on the top menu. Click List on the top menu to return to the Main Accounting Board and you will see a new red line for the Late Fee. 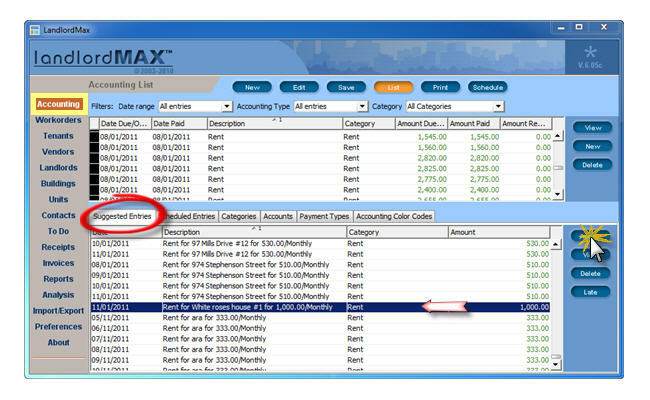 Later when you receive the payment for the rent, select the entry on the Main Accounting Board and edit the information. Select the Entry and click View on the right side menu. Enter the date it was paid and the amount paid. Click Save on the top menu and then click List to go back to the Board. The Entry should no longer be highlighted red because it has now been paid. Similarly, once you receive the payment for the Late Fee, select the corresponding Entry to the Late Fee and click View on the right side menu. Indicate the date it was paid and the amount paid. Click Save on the top menu and then click List to return to the Board. The Late Fee Entry should also no longer be highlighted red.